Adding pages in the Pages panel creates the structure of your site. By adding pages to navigation sections, you create a menu of links visitors use to explore your content. This guide walks you through adding pages to navigation sections and the types of pages you can add. Tip: For a general overview of the Pages panel and navigation sections, visit Understanding the Pages panel. 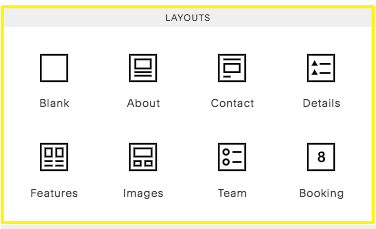 Tip: Currently, the Squarespace App only supports adding Layout Pages. Use a desktop or laptop browser to add other page types. Click the + icon beside the section where you want to add a new page, or click Add page at the bottom of a folder or Index Page. Tip: Where you add your page affects how it appears on your site. To learn more, visit Understanding the Pages panel. 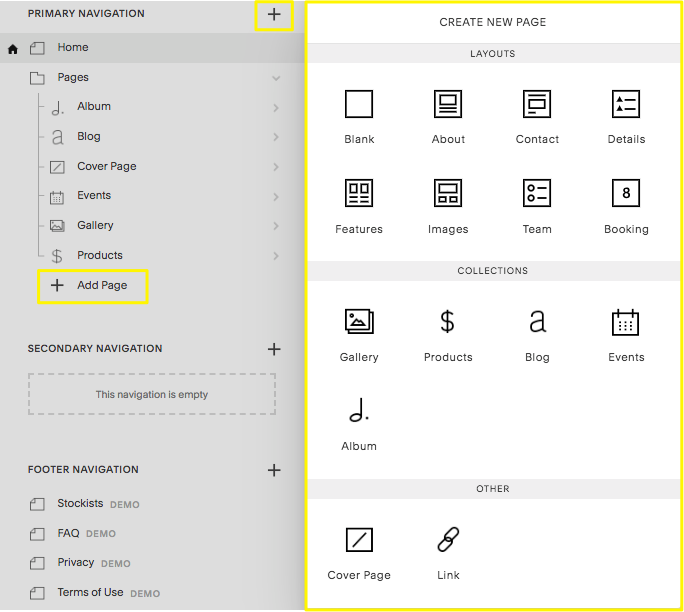 In the Create New Page menu, select the type of page you want to add. If you're adding a Layout Page, you can select a starter layout. To learn more, visit Building a Layout Page. The page's URL will match the page's title. If there are multiple pages with the same title, the URL adds a number to the end. To manually change page URL slugs, visit Changing URL slugs. Tocca Aggiungi nella parte inferiore della sezione di navigazione in cui desideri visualizzare la Pagina di layout. Tip: If you have a Not Linked page you want to add to navigation, or a page you want to add to a different navigation menu, visit Moving pages around your navigation. Altre pagine, ad esempio Pagine di copertina, cartelle e link. Tip: Different templates have different page options, so yours may vary from the image shown here. A Layout Page is where you add combinations of blocks to create a custom layout of text, images, audio, forms, and more. When you add a Layout Page, you can choose between a blank page, where you create the layout from scratch, or a starter layout designed for certain uses like Contact pages and About pages. Starter layouts have placeholder blocks to help you get started, but are completely customizable. While other page types feature unique designs that can vary between templates, Layout Pages are universal. Using blocks like Summary Blocks, Archive Blocks, Product Blocks, and Gallery Blocks, you can use a Layout Page to create alternatives to your template's default Gallery, Blog, Products, and Event Pages. With the exception of Album Pages, collection pages have a two-level structure. 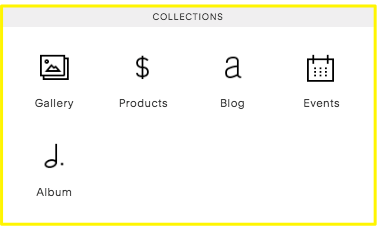 Visitors can view a collection page, like a blog page, then click individual collection items, like a blog post, to view an item-specific page. Collection pages vary between templates, using distinct features and designs to present collection items in exciting ways. There are three types of organizational pages you can use to structure your other pages or link to external content. Index Pages present multiple pages of content in a single location. Pages within the Index appear as a grid of thumbnails, single continuous pages, or other unique designs. Designs vary between templates, and not all templates support Index Pages. 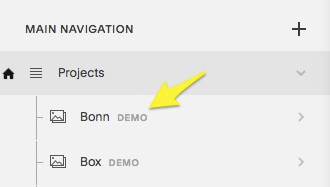 Folders group multiple pages into a drop-down menu in your navigation. Links create navigation links to external content or your own content, sorted by tags or categories. Cover Pages work differently than the page types covered above. A Cover Page can act as a bold splash page or distinctive single page on any template, incorporating full-bleed images and other special features. Cover Pages have a more fixed design than other pages, helping you concentrate on a simpler message. Info Pages are special pages, only available in the Aubrey and Aviator templates. They function similarly to a Cover Page. Every template includes demo pages that highlight the template's strengths and possible uses. These example pages have a Demo label to the right of the page title. To learn more about using or removing these pages, visit Working with demo content. Click and drag your pages to rearrange your navigation or move pages to different sections. To learn more, visit Moving pages around your navigation. Hover over page titles and click to open and edit the Page Settings. To learn more, visit Page Settings. Hover over page titles and click the trash can icon to delete pages. You can restore deleted pages within 30 days of deleting them. To learn more, visit Deleting a page.